A six-person international ecumenical delegation, comprised of representatives of the World Council of Churches (WCC) and the World Communion of Reformed Churches (WCRC) and led by Rev. Dr. Olav Fykse Tveit, WCC general secretary, and Rev. 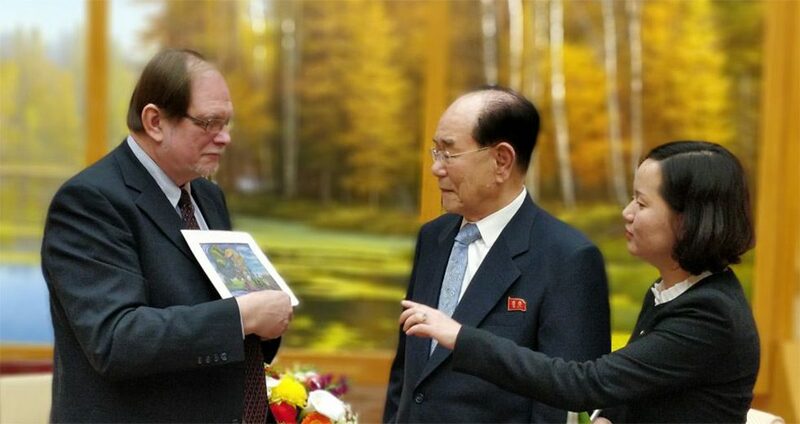 Dr. Chris Ferguson, WCRC general secretary, visited Pyongyang on 3-7 May, at the invitation of the Korean Christian Federation (KCF) of the Democratic People’s Republic of Korea (DPRK). This visit took place just a few days after the historic events of the Inter-Korean Summit at Panmunjom on 27 April, at which president Moon Jae-in of the Republic of Korea and chairman Kim Jong Un of the State Affairs Commission of the DPRK jointly signed the Panmunjom Declaration for Peace, Prosperity and Unification of the Korean Peninsula. These extraordinary initiatives have created a new momentum for peace which the delegation strongly wishes to affirm, support and encourage. The worldwide ecumenical movement has been engaged in promoting dialogue, peaceful co-existence and the reunification of the divided Korean people for more than 30 years, especially since the 1984 Tozanso Consultation convened by the WCC. Relationships with and between the KCF of the DPRK, the National Council of Churches in South Korea (NCCK), and WCC and WCRC member churches in South Korea have been at the centre of this ecumenical solidarity movement for peace and reunification of the Korean Peninsula. During the visit to the DPRK, the delegation met and discussed with representatives from the KCF, as well as with H.E. Kim Yong Nam, president of the Presidium of the Supreme Peoples Assembly of the DPRK, and with Prof. Dr. Ri Jong Hyok, president of the National Reunification Institute. Tveit and Ferguson met in Seoul prior to traveling to the DPRK with H.E. Cho Myoung-Gyon, South Korean Minister for Unification, and the ecumenical delegation met with President Kim Yong Nam of the DPRK Supreme People’s Assembly in the DPRK and they affirmed and emphasized the importance of the role of church leaders and faith communities in past and future efforts for peace and reunification of the Korean people. Image at top: WCRC General Secretary Chris Ferguson presents a gift to H.E. Kim Yong Nam, president of the Presidium of the Supreme Peoples Assembly of the DPRK.